Walmart, Best Buy, and Newegg are running various deals on the Apple Watch on Mother's Day, but the promotion is likely to extend for a few more days or while supplies last. 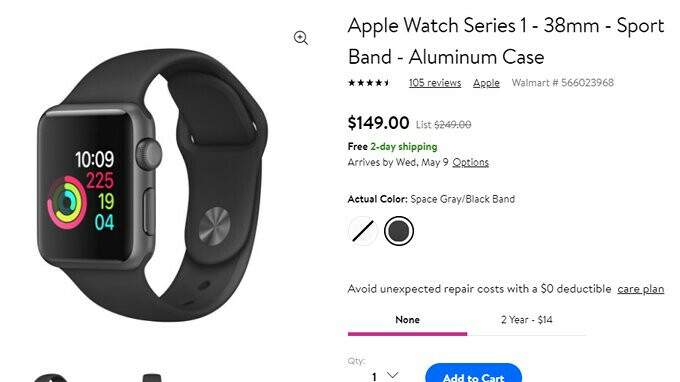 Out of the three major US retailers, Walmart seems to have the best deals on the Apple Watch Series 1, but you'll have to hurry since some of the models are already out of stock. We've managed to identify two Apple Watch Series 1 models that still appear in stock and have their prices cut by $100. First off, the Apple Watch Series 1 38mm Sport Band (aluminum case) is on sale for just $149, which means the smartwatch is exactly 40% off. The problem is you can only get the Space Gray/Black Band variant, as the Silver/White Band is not available any longer. On the other hand, the Apple Watch Series 1 42mm Sport Band (aluminum case) is on sale for $179, exactly $100 less than its MSRP. Keep in mind that you'll only get the 40% discount if you choose the Silver/White Band model since the Space Gray/Black Band variant costs $233 (only 2 units remain in stock). Regardless of either of the two Apple Watch smartwatch models you decide to purchase, you'll be getting free shipping. We're not sure how long these deals will last, but, as you can see, they seem to sell fast. $179 for the 42mm isn’t bad at all. I’d have to have no older than a series 3 though. The fitness app, and heart rate monitoring is awesome. I was considering getting this for my mom for Mother's day? Is the Series 3 really that much better? In every way. It’s a much better watch, but the question is...will she utilize it to its fullest? These have been on sale in the stores for 3 weeks now.